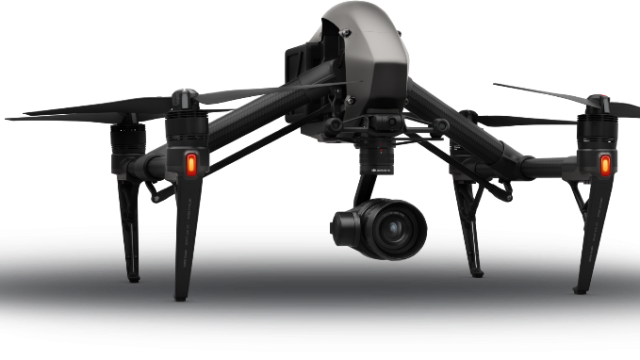 Dji Inspire 2 has beed released now! 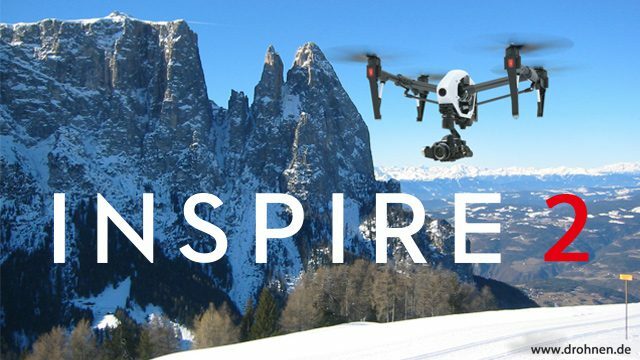 The Inspire 2 comes with the new X4S or X5S camera and was announced together with the brand new Dji Phantom 4 Pro. We shortly received first leaked spyshots or marketing pictures from one of our co-editors showing a new quadcopter prototype which seems to be the DJI Inspire 2. Remarcable are the extendes landing gear legs that achive an even more reveiling chassis clearance. This enables this second generation transforming UAV to carry bigger DSLR cameras as shown on the picture. The shown camera seems to be a Canon EOS 5D mounted on a new special gimbal. 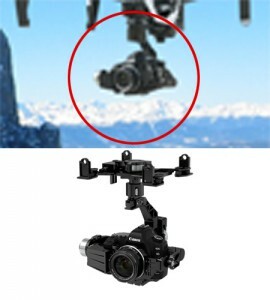 First rumours say that this gimbal might have the same quick release connector as used on the DJI Inspire 1 – so it might be possible to also attach the Inspire 1 camera to this DJI Inspire 2. Maybe there will be several options available – with different camera types. We assume that this new gimbal is mainly based on the existing Zenmuse Z15 technology and body. Maybe it is completely identical except the quick release mounting connector. On the left hand picture you can see the resemblance of both systems (more details on all new Dji Aerial Gimabls). It might be possible to attach this gimbal to the DJI Inpire 1 as well – but the chassis clearance won’t be big enough to keep the camera away from the ground when in langing mode. There might be some ways to built some selfmade landing leg extensions. 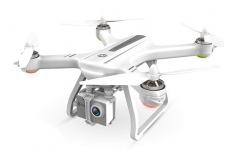 Second issue might be the payload of the DJI Inspire 1. It might not be able to carry the heavy DSLR Canon 5D with Zenmuse Gimbal. 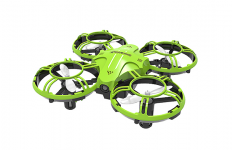 We assume that the DJI Inpire 2 will have an extended payload (see below). 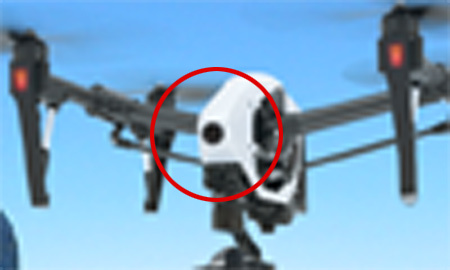 Most amazing is the independant and integrated FPV camera in the front nose of the DJI Inpire 2.0. 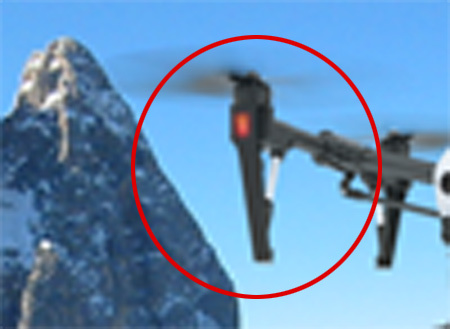 This second camera allows the flight operator to still fly in FPV mode and use this FPV videostream while the second operator can use the DSLR-Camera view and operation mode to control the main DSLR camera. The DJI Inpire 2 will only be available with Dual Operator Controls with two separate remote controls. The DJI Pilot App will have the ability to select different modes for flight operator and camera operator. So both can select if they which to see the videostream of the DSLR camera or of the FPV camera. To manage the extended load if the Canon DSLR and the new gimbal, we assume that the new E1200 Pro Tuned Propulsion System with the new motors, ESCs and propellers will be used for the DJI Inspire 2. 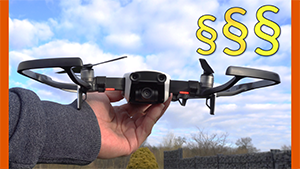 17-Inch Ultra-Carbon Folding Propellers allow to relieve the propellers in place during transportation – all you need to do is to bring the DJI Inspire 2 into tracel mode and fold the propellers. 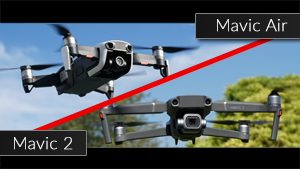 The most interesting question for all DJI Inspire 1 owners will be: which of these functions and features can be upgraded to all DJI Inspire 1 generation models? 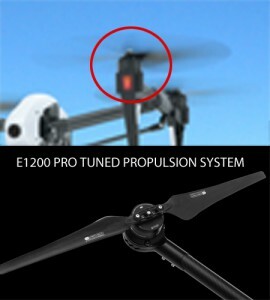 We assume that the E1200 propulsion system might be available as upgrade. 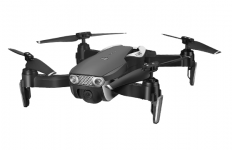 But most other new features will be exclusivly available for DJI Inspire 2 owners. 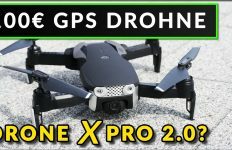 There might be some ways to get some features working on the DJI Inpire 1 – but this might require extensive customization and will surely kill the warranty. More questions and discussions about these leaking photos of the Dji Inspire 2 from Dji Innovations can be found here in the DJI Inspire Forum.